Cate`s Place: HO HO HO Blog Hop! My Day! HO HO HO Blog Hop! My Day! Hello! It`s my day to share my HO HO HO Blog Hop project. Thank you Madam Samm for your genius in creating these Hops and thank you Carol for being our outstanding Cheerleader! I am happy to be able to participate. My project is a table topper. I used Moda`s Blitzen charm squares. The backing is a red cotton Christmas holly print from my stash. Thank you for making time to visit, I really appreciate it. Please visit the other blogs at the links below. They all have beautiful projects to share and perhaps a Giveaway or two. Thank you! You will notice I have not displayed my project hanging in a Joshua Tree. The quail families have taken over, resting in the shade provided by the trees. Quails are my favorite bird! Thanks for sharing your table topper! What fun and how very nice of you not to disturb the family of quails :) Thank you for sharing in this very fine hop!! Love the fabric you used for your table topper! Thank you for sharing. What a pretty table topper and I think you photo in your header is phenomenally beautiful ! Your fabric choice is amazing! Very nice! Thanks for sharing! I love your table topper! It showcases the gorgeousness of your fabrics! Amazing. However. It took me a while to get to your project... I was lost in that absolutely stunning picture on the top of your blog. What a view! Your little quilt is sweet. Cute fabrics--great table topper. I really miss hearing the quails--we don't have many in our area any more. Thanks for sharing! Thats very cute, lovely fabrics you've choosen. Thanks for sharing your cute table topper. Your table topper is really nice! I love the fabrics. Ohhh that blitzen..I still have some of it...wasn't it a really nice blend of holiday fabrics..you did well to make a table topper.. I really like the fabrics you used in your table topper. Thanks for sharing! Very nice table topper...love the fabrics....enjoy your day. Pretty table topper. The fence works as well as the Joshua tree for the photo, lol. Love this fabric line!! Thanks for sharing in the hop. Thanks for sharing. Love the quilt! It's beautiful!! And good luck to the quail family! I saw my first Joshua tree this summer. Exciting! Your projects are beautiful and perfect for the occasion. Thanks for hoping and sharing with us today. I love your table topper. I know it will be beautiful on your table. Thanks for sharing. I love the binding on your quilt. Great project - I love Blitzen! Very pretty fabric in your beautiful table topper. Thanks for sharing. Cute topper! I love a quick project that makes a big impact. Great job! so pretty! I made a table topper as well for the hop! I am loving all these beautiful creations! What a cute topper,it sure would look good on my table,LOL. Good choice of fabrics. Great job, nice of you to hop with us. What a cute table topper. The quails are great! The table topper will be a great additional to Christmas this year and become an heirloom. Thanks for participating and being a great inspiration. Your table topper is so pretty. I love this fabric and it looks really good in the topper. Thank you for sharing. What a pretty table topper, Cathy! The fabrics are lovely. Great fabrics! Place a bowl with Christmas balls in it, and there: you are ready for Christmas! Very pretty table topper. Blitzen is one of my favorite Christmas fabric collections. I love your table runner.....great fabric. Thank you for sharing. Very nice fabrics in your table topper! Thanks for sharing. 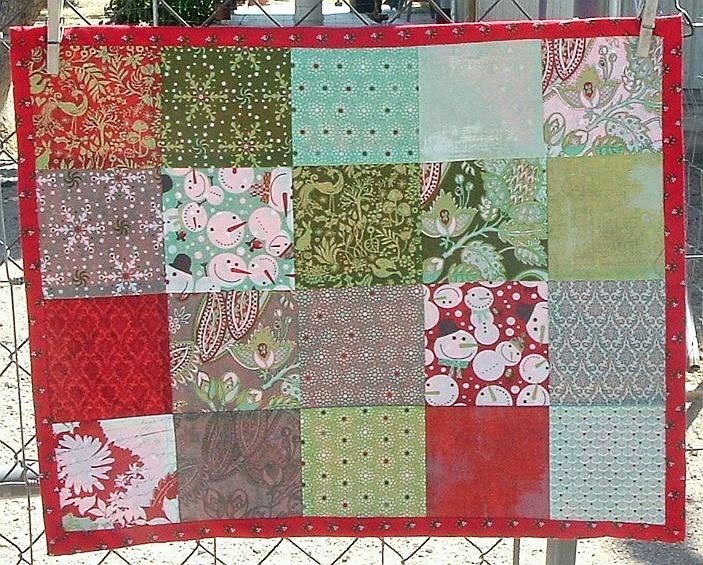 I love patchwork projects; it shows off the fabric so well. Your table topper looks great. I love the fabric that your used on your lovely little table topper. Hi Cathy. I love your Moda table runner!! Isn't this HOP fun!! Your table topper is lovely. Love the simplicity of your tabletopper. I can enjoy looking at each print one by one. Thanks for sharing. Lovely Topper. Thanks for sharing! Very nice. I like that collection, too. The snowpeople fabrics are my favorites. You little table topper is beautiful thanks for sharing. A simple pattern with such cute fabrics. Thanks for sharing with us. Very pretty table topper. I love that Blitzen line of fabric. fun project and cute fabric. Thanks for sharing in this hop. Thanks for sharing! I also love your header photo. Simple and sweet...great fabric line! Thanks for sharing. I love the fabrics you chose for your cute project! Thanks for sharing your work! I hope your quail friends are enjoying a bit of cooler temperatures!